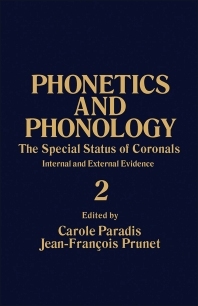 Phonetics and Phonology, Volume 2: The Special Status of Coronals: Internal and External Evidence contains a phonetic survey of coronal articulations and discusses many aspects of the phonological behavior of coronals as opposed to noncoronals. This book discusses the asymmetry and visibility in consonant articulations, coronal places of articulation, and underspecification of coronals in English. The cluster condition in Attic Greek, palatalization and representation of coronal, and relationship between laterality and coronality are also elaborated. This publication likewise covers the cross-linguistic survey of consonant harmony, coronals in child phonology, and coronal transparency in vowel spreading. This volume is intended for graduate students and scholars interested in phonology, phonetics, general linguistics, psycholinguistics, or language pathology.